When the archives of your life are disturbed you uncover some interesting things. Layers of yourself, that you buried for one reason or another. Some you meant to return to; some you were determined to remember; some you very clearly meant to forget. 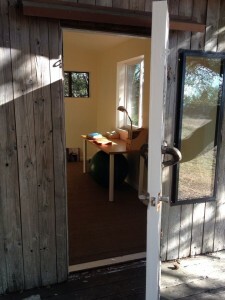 I have been working my way through a fifteen-year-old file cabinet, clearing out the old and making way for a transition to my new office, a small studio at the edge of the woods that my husband renovated for me. It is called “The Caboose,” and it will be dedicated to writing and editing. And when I sit down in my studio, I am faced with a three-year-old computer that holds about twenty years worth of writing and miscellany, and I have been cleaning that up, too. One of the first things I discovered in the process is that I have already (inadvertently) lied in this blog. In my very first post I wrote that “until this past year I had never published a word as my unadorned self.” But a decade ago, when I was organizing against the burgeoning wars in Afghanistan and Iraq, I wrote two sermons for the Unitarian Universalist Church of Palo Alto, both of which can be found online, as well as a short piece that was published in their member magazine, Mosaic. All three of these pieces were written in the turbulent wake of September 11, 2001, when I was on leave from my doctoral program in history at Stanford, and working on The Insular Empire, a documentary film about U.S. militarism and the indigenous communities of Guam and the Northern Mariana Islands. They were also written before I had children, and when I was questioning my commitment to becoming a historian, wondering (agonizing over) what kind of life I might otherwise lead. The first sermon, “Living the Burn, Creating a Life,” was about my experiences at Burning Man, and drew parallels between the radical creativity and community of that festival, and the creativity and community I found while organizing against the wars. The second, “Holding Fast to Truth and Nonviolence,” was about the principle of satyagraha, peace as not just goal but means. It arose from my participation in a Peace and Nonviolence Study Circle at the church. The magazine piece was a journal of my reaction – grief, numbness, indignation – to the initial bombing of Iraq. What I find now in the sermons especially is an out-loud confidence, a tendency towards proclamation, that I no longer feel, and that hid a lot of complexities I was experiencing inside. “Art that preaches or teaches overtly is lessened by the sermon or the lecture,” says Ursula K. LeGuin. But I don’t feel like beating myself up about that. It’s an archive, after all, and as a trained historian I have a lot of experience with archives, and know that blaming and shaming the creators of them always, to me, felt like shouting into the wind. After a vigorous argument with a dead British imperialist or land-hungry settler, I always felt kind of winded, empty and even mean inside. I don’t know how to track the shift between then and now. In some ways I am much more tentative; in others I am much more bold. Is it the inevitable slowing down and enforced humility of motherhood? Is it that I have learned to more deeply value quiet and patience, from both my children and my community? Is it the experience of burning out after the brilliant flare of hope that was my experience of Occupy? Is it the realization that I can be happy just following a deer trail across a meadow in the afternoon wind? Is it just growing older, inside and out? I don’t actually need to track the shift between then and now. I am not a historian anymore. In my best moments I can breathe and make space for all the people I have been, am now, and may someday be, and see the silver thread of caring for the world running through. In my worst moments I feel like a tornado inside the earth’s crust, not knowing the extent of my own damage, or how to reach my destination. But pretty much all the time now, I feel I am on the verge of something not at all definitive, but delicious. I am no longer arduously creating my life, should by should, could by could, would by would. Finally I am doing my best just to live it. We want to keep up with our girl’s life and adventures. Heat a thin piece of steel until it glows, then let it cool slowly in the open air: it becomes soft, and easily pliable. Heat it to glowing again, then plunge it into cold water: it becomes rigid and brittle. Don’t break it: heat it to just a few hundred degrees, stopping well short of the glow, and let it cool. Do it right, and you get the best of both worlds, a spring equal parts strong and resilient. I think — I hope — that time tempers us the way the way a smith does steel. Thank you so much for reading and responding, Dan. I read your words over and over again; they are so perfect and elegant. They made me wonder about all the times I have been through that kind of fire. Yay! I love this. You go girl.